This next mutual fund is also the Top S&P Mutual Fund for 2011. The Harding Loevner International Equity Portfolio is an international stock fund which invests in foreign companies in term of common stocks, preferred, warrants, convertibles, derivative, etc. You can find the fund’s review below. The investment objective of Harding Loevner International Equity Portfolio fund is to provide long-term capital appreciation. This top foreign large growth fund invests in companies based in developed markets outside the U.S., and in established companies in emerging or frontier markets. It generally invests majority of net assets in common stocks, preferred stock, rights and warrants issued by companies that are based outside the United States, securities convertible into such securities (including Depositary Receipts), and investment companies that invest in the types of securities in which the fund would normally invest. The fund may also invest in derivatives. This fund typically holds 35-75 investments across at least 15 countries. 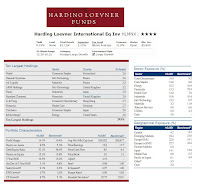 This Harding Loevner fund is currently managed by Simon T. Hallett. He has managed this fund since the introduction of the Institutional Class (HLMIX) on May 1994. The investor class itself (HLMNX) was introduced to public in September 2005. The expense ratio of this HLMNX fund is 1.25%. This figure is lower compared to the average in the Foreign Large Growth category (1.49%). This foreign large growth fund has 4-stars return rating from Morningstar. The best 1-year total return of this best stock fund was achieved in year 2009 with 40.14% within the total of 4 years of positive return. The only year when this fund had negative performance was in year 2008 with -39.40%. The minimum initial investment to invest in either the brokerage or IRA account of this best mutual fund is $5,000 with no minimum subsequent investment. The 12b1 fee is 0.25%. This is a no-load fund (means there is no front-end sales load fee). There is no 12b1 fee for investing in Institutional Class. The expense ratio of HLMIX is 0.93%. It has recorded 11 years with positive return and 5 years of negative return since its inception. 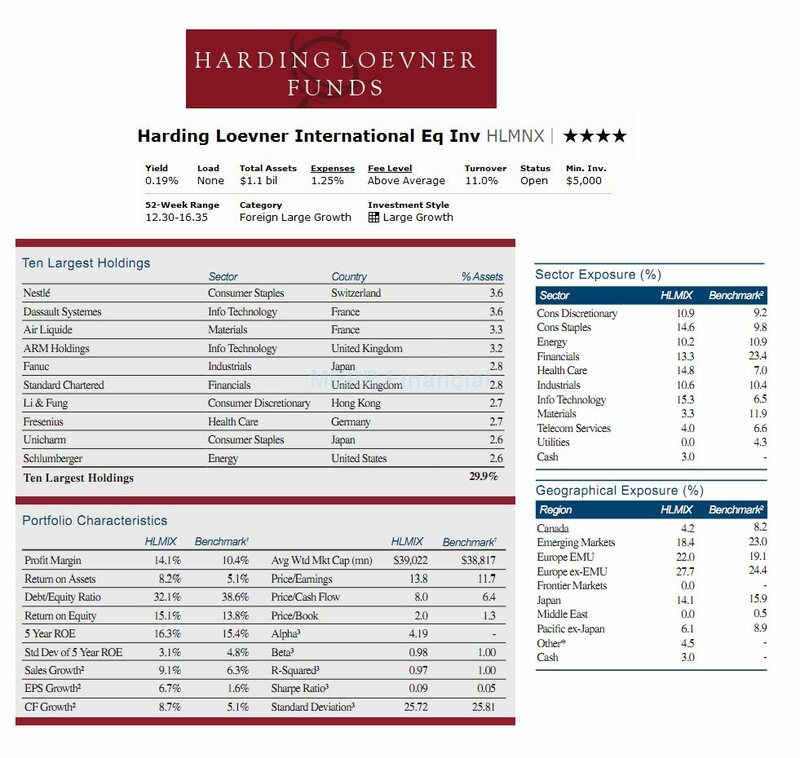 The top 10 holdings of this Harding Loevner fund as of September 30, 2011 are Nestle (3.6%), Dassault Systemes (3.6%), Air Liquide (3.3%), ARM Holdings (3.2%), Fanuc (2.8%), Standard Chartered (2.8%), Li & Fung (2.7%), Fresenius (2.7%), Unicharm (2.6%) and Schlumberger (2.6%).